Moreover, the traditional information and communication technology (ICT) vendors often don't benefit from this ongoing infrastructure expansion, because the cloud providers prefer to invest in open technologies from low-cost 'white label' ODM commodity vendors. That's unlikely to change. The hyperscale or webscale cloud service providers -- including the seven largest (Super7) Alphabet, Amazon, Facebook, Microsoft, Alibaba, Baidu and Tencent -- believe they are best positioned to provide access to a variety of cloud services in a scalable and cost-effective way, and view their public cloud businesses as critical to their growth over the next five years. "All of the Super 7 companies are aggressively building data center footprints globally and are baking in significantly more capacity than they currently need in anticipation of future data traffic growth," said Chris Antlitz, senior analyst at Technology Business Research (TBR). 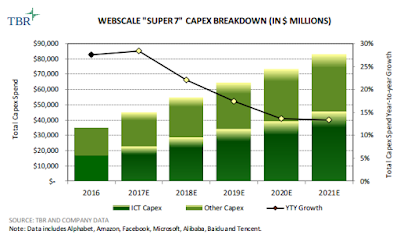 However, despite the addition of extra capacity upfront, capex growth will remain robust through the next five years as workloads increasingly move to the public cloud and as the digital ecosystem flourishes worldwide. Of the $16.9 billion in capex investment by the Super 7 on ICT equipment in 2016, TBR estimates around 75 percent was for data center infrastructure, with the balance of ICT capex spent primarily on optical transport, routers, switches, software and broadband access initiatives. According to the TBR assessment, The Super 7 are investing heavily in data centers to support the internal operations of their core businesses, and also for their external cloud services businesses, which are growing much faster than their core digital businesses. maps with low-cost open-source hyperscale requirements stand to win the most business from webscale companies.